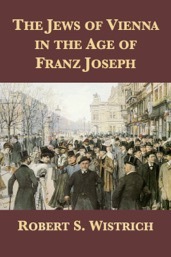 “Robert Wistrich’s exemplary scholarly analysis of the Viennese Jewish community in the 19th century is the first well-written, reliable study of its kind... gives elegant portraits of the crucial Jewish figures of the new Viennese politics at the turn of the century... focus[es] on the internal history of the highly diversified Jewish community... [Wistrich] analyzes effectively the genesis of Herzl’s Zionism from within the Viennese context. Although his sympathies for Zionism are clear, he is respectful of Jewish critics of Zionism. What is refreshing in his narrative is the absence of retrospective critical moralizing about assimilation and the remarkable participation of Jews in German culture. Assimilated Jewish aristocrats and intellectuals, even Jews who converted to Christianity, are presented with as much evenhandedness as those Viennese Jewish nationalists and traditionalist theologians whose mistrust of assimilation and acculturation as reliable defenses against prejudice seems to have been vindicated by the Holocaust.